Texas A&M AgriLife program specialist Dotty Woodson retired this week after three decades teaching others about plants and water conservation. Photo by Gabe Saldana/Texas A&M AgriLife. A longtime gardening expert who had a knack for making even drip irrigation sound fun retired Wednesday. Horticulturist Dotty Woodson recently ended her three-decade career, which included 24 years as an extension agent for Tarrant County, then water resource specialist with Texas A&M AgriLife Extension, where she served on AgriLife Research’s Water University team. Previously she taught horticulture at Tarrant County College. I first met Dotty years ago while hosting Mother Earth News Radio. We were both attending a state conference for Master Gardeners, where she was a speaker. One of my cohorts suggested I attend Dotty’s program on drip irrigation. (Now there’s a hot topic!) I slipped into the back of the room, planning to skip out after a few minutes of what would surely be boredom. I ended up staying for two hours. 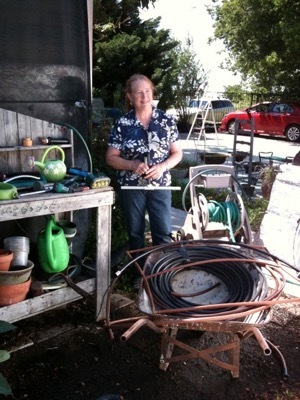 Dotty Woodson shows off her drip irrigation supplies. Photo by Andrea Ridout. By the time Dotty’s talk was over, everyone in the class, including me, was so excited about drip irrigation that you would have thought we had just won the lottery. Drip irrigation! It was like an amazing solution to just about everything. That’s the kind of enthusiasm that Dotty was able to drum up wherever she went. It was those kinds of stories that drew attendees to her sendoff party last week where I watched friends and family pay homage to Dotty’s commitment to North Texas and beyond. 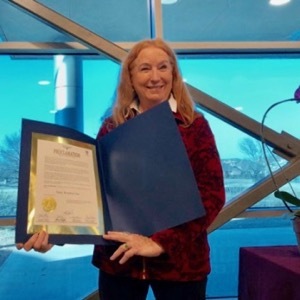 Many knew her through her classes on water conservation, rain barrel-making, composting, gardening and plant care as well as her service on numerous boards and committees, some of which strongly influence the way that we utilize water in North Texas. She was also familiar face on local TV stations including NBC and has appeared on screen with me several times over the years. Her iconic flash of red hair always makes me smile and I never fail to learn something new each time that I see her. Dotty accepts the proclamation of Dotty Woodson Day from the city of Fort Worth. Photo by Andrea Ridout. At the retirement party, which was held at Agrilife’s beautiful new Water Education Building that is part of their research center on Coit Road in far north Dallas, Dotty’s colleagues presented her with numerous honors including recognition from Texas Governor Greg Abbott and Dallas Mayor Mike Rawlings. But it was the designation by Fort Worth Mayor Betsy Price of Dotty Woodson Day on Wednesday that brought a tear to Dotty’s eye. I’ve never seen my friend at a loss for words but she actually choked up a bit as she thanked the attendees for their accolades, hugs and applause. Dotty’s title at Agrilife was simple - Program Specialist, but that belied her true role. Not only did she teach literally millions of people about irrigation and gardening, but she was able to infuse into that education an almost religious fervor about water and why its care and conservation is so vital to our very survival and that of this planet with which we have been entrusted. From installing rain barrels to converting one’s lawn to native plants, she has been an influencer who has changed the public’s viewpoint on methods to preserve and protect every drop of our most precious of natural resources. 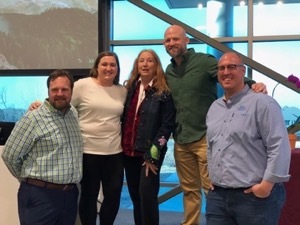 Dotty's colleagues from AgriLife’s Water University, from left, Clint Wolfe, Tamaron Hunt, Dottie Woodson, Patrick Dickinson, Daniel Cunningham. Photo by Andrea Ridout. Daniel Cunningham will be taking over Dotty’s weekly Sunday morning TV segments at NBC-5 and admits she left some "big shoes to fill" after 25 years with NBC. “Dotty has been an incredible mentor to me personally but has also been a tremendous resource across the state,” said Cunningham. Dotty won't be idle post-retirement. She intends to her pursue her passion for gardening at her orchid greenhouse, D and B Orchids. I learned of Dotty’s affinity for orchids when I was working on a television show called Dig In, hosted by Neil Sperry. My roaming reporter duties included covering a variety of eco-friendly topics around the area and I was able to interview Dotty at her home and nearby orchid greenhouse. We taped several segment topics for the show including drip irrigation (of course), fairy gardening and my favorite that included a tour of the greenhouse itself. 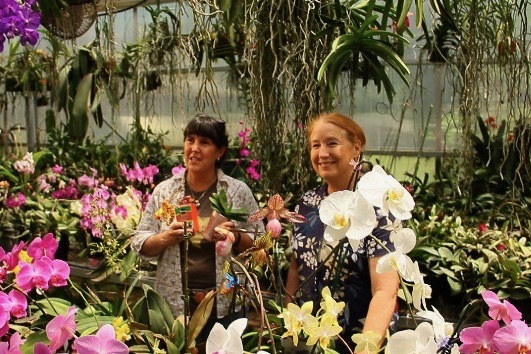 Green Source DFW reporter Andrea Ridout with Dotty Woodson and her orchids. Courtesy of Andrea Ridout. I’ve never known much about orchids but these delicate plants took on a certain magic as Dotty showed our TV audience some of her favorites. From the fabulous hanging purple vanda orchids to the colorful yellow Oncidium papilio or ‘butterfly orchid’, Dotty described each one as though they were dear companions.